Has Christchurch UFB been done yet? Ping to Christchurch Speedtest (no Spark Christchurch Speedtest available) suggest not. Also, this is a way to access the Spark Chch speedtest.net server until it turns back up in their system. And my ipv6 pod errors have also disappeared from my logs, so much tidier. Dates of the planned work by region below. Tauranga has been completed. Is Auckland on track for a reboot tomorrow morning (Thursday 28 June)? Circling back to let @cbrpilot @IPv6pipe know that our Riversdale Beach via Masterton BigPipe connection did change to Spark network around 25 June 410am. Spark DNS now works on beach connection and the Spark DNS servers are indeed being given to the ADSL 2+ modem at the beach as @cbrpilot said they would. Latency from beach to Wellington reduced to 17ms from 37ms which is a great improvement between my sites, thanks heaps! No change for the latency between the beach and 2talk, nzherald, amazonaws kids game server australia which are presumably via Auckland and @cbrpilot said probably wouldn't change. There were two outages on the beach BigPipe connection today (internet only not power cut), day after migration to Spark network, at 130am and 9am, we are not fussed, outages do occur in rural New Zealand, but after the second outage all latencies did increase by about 1-2ms which is possibly another network reconfiguration but not significant, but thought you might want to know. - Spark fibre city connection (2talk, nzherald, both presumably Auckland, up to near 100ms presumably routed via a close planet) (amazonaws kids game server australia and wellington both no change routed normally). 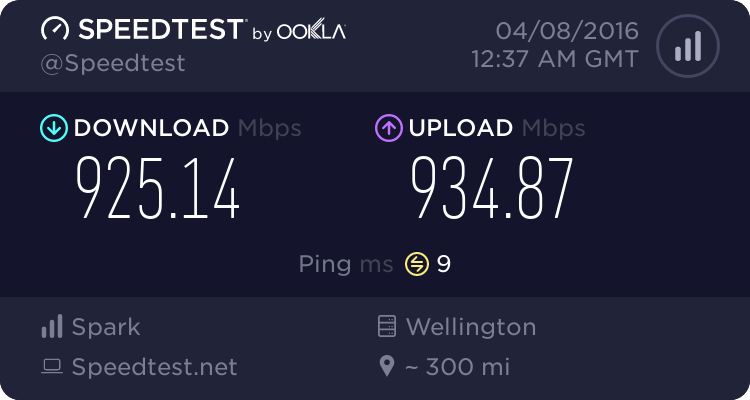 - BigPipe adsl 2+ beach connection (amazonaws kids game server australia, up to near 100ms presumably routed via a close planet) (2talk, nzherald presumably or wellington presumably direct both no change routed normally). I've been having DNS issues all day today after the Auckland changeover. It seems to be every 2 hours or so I can't resolve any hosts at all for about 5 minutes before it fixes itself. Seems to only be a DNS issue as livestreams I'm watching are unaffected, I just can't do anything else. My router has correctly updated to the spark DNS servers, I've flushed my DNS, restarted the router and ONT a couple of times but I still continue to have issues. My router is a NF8AC which BigPipe recommend. Anyone else experiencing similar issues after the changeover or know any fixes? To troubleshoot, if it's happening regularly and predictably then it would be worth setting the DNS servers manually on the PC you're using instead of using relay on the router - that at least might point to where the issue is. Are you able to check with the router to see if the PPP session is going down at all? It was just down again for a while so I swapped to google DNS for a bit. I've manually set DNS server in windows now too so will see how that goes. I checked my router log and there was some alerts about ppp earlier and I did notice some warnings about DNS that seem to be when it goes down. Here some of the entries from my router log this evening. Jun 28 23:15:31 daemon warn kernel: dnsproxy/413: potentially unexpected fatal signal 11. Jun 28 23:45:07 daemon info kernel: dnsproxy/3193: potentially unexpected fatal signal 11. You should be able to disable the DNS proxy function under the left hand side menu with that name. Apply/save then restart your router. yitz: You should be able to disable the DNS proxy function under the left hand side menu with that name. Apply/save then restart your router. Thanks I've disabled it again and it seems to be working alright now. I had tried disabling it earlier when I wasn't having any issues and it would cause issues if I turned it off, seems to be ok now though. I think the the DNS issues must be to do with my router, I manually set the spark DNS servers on my PC and haven't had any more issues yet, but my girlfriend said her phone coundn't connect to anything for a couple of minutes just before. Yeah you might need to reboot your phones/devices after disabling DNS proxy as devices will need to pick up new DNS IPs from the LAN DHCP server. I have the same router as you and I'm having similar trouble with connection drop outs today. I'm interested to hear if you managed to fix your connection drop outs as I'm hoping I might be able to fix mine the same way. I've done a factory reset and loaded the default recommendations from the bigpipe website but that only fixed the issue for an hour or so before it started failing again. Are you sure the PPPoE session isn't dropping every 4 hours then it could be because you are mis-provisioned or an Anonymous user. It's worth contacting bigpipe and asking if they can check if you are properly provisioned and not Anonymous. @cbrpilot or @Talkiet any chance you could check these folks are anon or not. It would be really useful if someone would have built a site to let customers check if they were anon or not then they could click on a link and instantly see that was the reason.